manufacturer, product type, page number or part number. Still can't find what you're looking for? Just ask, we have much more available. Printed copies are free with your order, Visit our Contact us page to get in touch with us today! In racing, much emphasis is put on winning. Of course, to win you must finish and to finish, you must start. 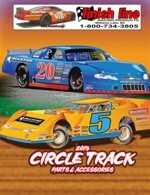 Our latest Circle Track Catalog provides the components and tools to help you start, finish and win! Nothing brings a crowd to it's feet quicker than the start of an open wheel race. As the cars take the green flag and roar into turn one, each driver's ultimate goal is capturing the checkered flag. We bring that same excitement, passion and commitment to the sport of open wheel racing. 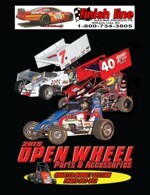 This nearly 500-page catalog is chocked full of the components that you need to build a winning combination. We are committed to providing the parts you want in a manner that is not only timely and accurate, but with superior customer service. Our latest edition of this catalog addresses the traditions of "old school" enthusiasts as well as the needs of the modern day performance junkie. The following pages are designed to build, maintain, and improve your Hot Rod and Early Muscle Car, ensuring the hobby will continue into the next generation. There’s nothing more exhilarating to the drag racer than being behind the wheel as the car launches from the starting line and heads down track. As the car accelerates and roars past the Christmas tree, the driver focuses upon the finish line with the goal of taking the stripe and turning on the win light. In the pages of this catalog, you will find the parts that can help make your car quicker, faster, more consistent and safer. 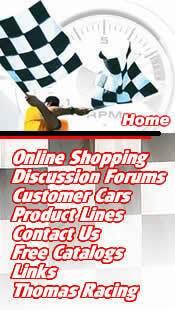 We share that same passion for drag racing and are focused upon providing the best parts currently available! 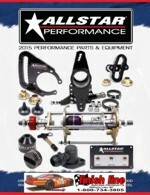 The 2012-13 Engine Builder Catalog is the most comprehensive one to date. It was originally conceived with the notion that engine builders would find it much easier to order parts and tools if all related components were contained in one book. So far, this concept has proven to be right, and the catalog remains a valuable source book for our engine builder customers. In the 1990's new car performance saw the birth of what is commonly called Late-Model Muscle. Computer controlled fuel injectors replaced carburetors, and improving a car's handling meant more than the ability to keep a driver running in a straight line. The current generation of enthusiasts desire larger sway bars, polyurethane mounts, as well as larger injectors and computerized engine tuners as "must have" performance components. The Late-Model Muscle Car catalog addresses the needs of car owners that want that feel of pushed back in the seat acceleration as well as road racing corner grip while keeping a car's daily driver characteristics. Many of the parts and components listed in this catalog feature technology that not only was unheard of just a short time ago, but also have become affordable for today's Late Model Muscle marketplace. 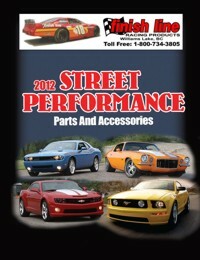 The Late Model Muscle Car Catalog is fast becoming the current generation's sourcebook for all things performance. When all is said and done, Main Street USA is still the number one automotive performance venue, and the number one market for street performance parts and accessories. The variety of street oriented performance vehicles on the road today is second only to the variety of the products included in this latest catalog.